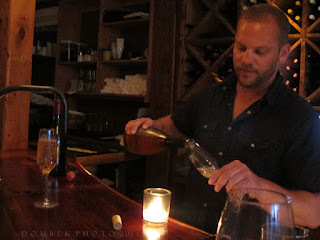 One of my absolute FAVORITE places to enjoy wonderful wines, tapas and great company is at Old Vines Wine Bar in lower village, Kennebunk. 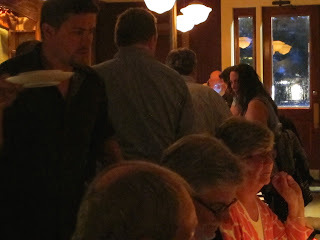 It's not unusual to find a fellow artist or compatriot there and always a pleasure to sit with a super gracious bar staff. Thanks Scott & Ben! WINES for the evening ... 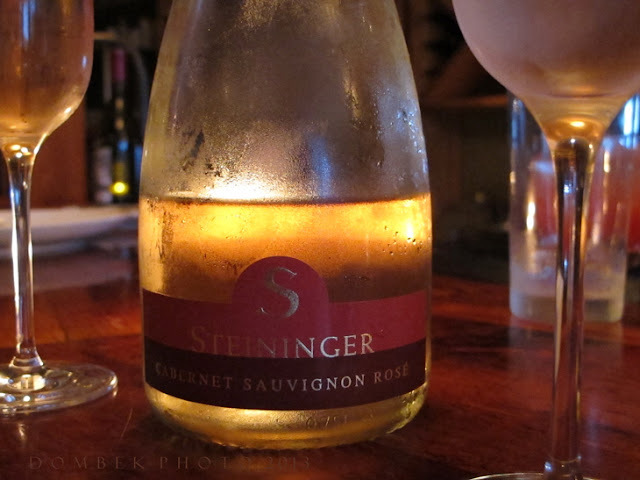 I am loving the Steininger Cabernet Sauvignon Sekt, sparkling Rose' from Kamptal, Austria, distributed here in Maine through CRUSH Distributors. Have you ever tried a sparkling Cabernet Sauvignon?? I had the opportunity of tasting it this past spring and was so happy to be reunited with it again at Old Vines. It's not what you might imagine, given the varietal. This is the loveliest light salmon pink color, not unlike a provencale rose'. Wild berries such as raspberries, strawberries, faint wild roses and perhaps some herbaceousness, along with a creamy mouthfeel make this a lively and elegant experience ... a little racy with a sparkly dry finish! Enjoy with some marcona almonds or selection of cheeses & arugula salad. 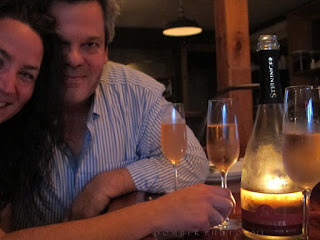 Compatriots enjoying the Steininger Cabernet Sparkling Rose! The Steininger Winery is family-owned and run, located in the wine growing village of Langenlois in the Kamptal Valley, Lower Austria. Best known for making wine from Grüner Veltliner, Austria's most important grape, they are also well know for producing exceptional sparkling wines, produced according to the traditional bottle fermenting method. Bravo! Available in retail locations: Browne Trading Co. & Whole Foods, Portland. Friends Deborah and Marc generously shared their bottle with me! 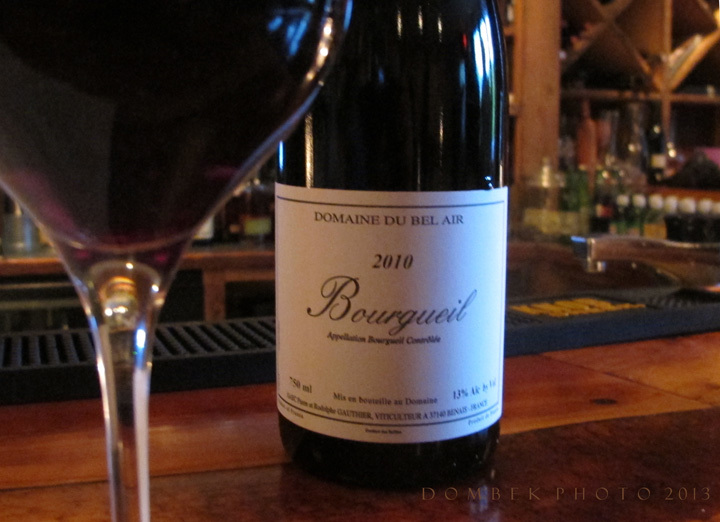 Next up was Domaine du Bel Air Bourgueil 2010, from Loire Valley, France. 100% Cabernet Franc. On the nose hints of violets & light tobacco, with violets, cassis and earthy bark on the palate. A light, dry red. Fun fruit, very approachable! And it's organic to boot. Pair with one of their French Cheeses, perhaps the Bucheron or even the Castelinhos, a soft cow's milk cheese from Portugal. This comes to us from Devenish Wines. Look for it at Rosemont Markets or Aurora Provisions. Bourgueil is an appellation in the Loire Valley located in the region of Touraine and one of the few areas in the Loire focused on red wines. 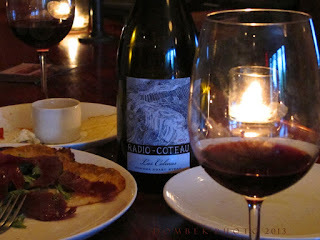 Radio-Coteau Syrah 2011 from Las Colinas, Sonoma Coast, California was a real pleasure! Stunningly deep burgundy/black magenta in color, with luscious aromas of dark fruits such as blackberry, plum and cherry lulling the nose and palate. Notes of black pepper and spice. Silky smooth on the tongue, with a beautifully balanced and integrated finish. This was a Wow. Paired with their house-made duck prosciutto on flatbread pizza ... stop the press! This little beauty comes to us from CRUSH Distributors. It is highly allocated and not even available retail. 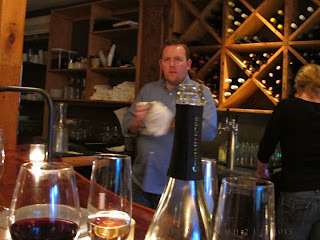 The folks at Old Vines were wise to snap some of this up. Go Taste! Old Vines Wine bar is the brainchild of Mike and Jodie Farrell. With many years in the hospitality industry, including stints at some of New York's top kitchens, Mike decided to relocate to Maine and open a place of his own. Located in an old renovated barn, full of warmth and atmosphere, it's within easy walking distance to Dock Square in historic Kennebunkport. I actually like that it's situated away from the fray however. To me all the more inviting, with time and space to relax and enjoy a glass and a plate of something delicious with a few friends. Enjoy!